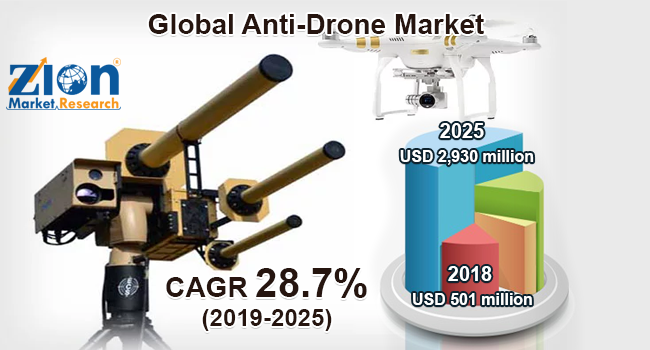 Global anti-drone market expected to reach approximately USD 2,930 million by 2025, at a CAGR of 28.7% between 2019 and 2025. The demand for anti-drone solutions is likely to be driven by rising government security issues related to unmanned aerial vehicles (UAVs) or drones. The report covers a forecast and an analysis of the anti-drone market on a global and regional level. The study provides historical data from 2016 to 2018 along with a forecast from 2019 to 2025 based on revenue (USD Million). The study includes drivers and restraints of the Anti-Drone along with the impact they have on the demand over the forecast period. Additionally, the report includes the study of opportunities available in the anti-drone market on a global level. This report offers a comprehensive analysis of the global anti-drone market along with market trends, drivers, and restraints. This report includes a detailed competitive scenario and product portfolio of the key vendors. To understand the competitive landscape in the market, an analysis of Porter’s Five Forces model for the market has also been included. The study encompasses a market attractiveness analysis, wherein all the segments are benchmarked based on their market size, growth rate, and general attractiveness. The global anti-drone market is segmented on the basis of the system, technology, end-user, and region. By type, the market is categorized into the neutralizing system and detection system. The neutralizing system segment is further classified into laser, drone rifles, jamming, drone capture nets, and interception. The detection system segment includes active optics, passive optics, RF emissions, radar-based, and acoustics. The technology segment includes an electronic system, a laser system, and a kinetic system. By end-user, the market includes government, military and defense, commercial, critical infrastructure, households, public venues, and others. All the segments have been analyzed based on present and the future trends and the market is estimated from 2019 to 2025. The regional segmentation includes the current and forecast demand for North America, Europe, Asia Pacific, Latin America, and the Middle East and Africa. Each region has been further segmented into major countries, such as the U.S., Canada, Mexico, UK, France, Germany, China, India, Japan, South Korea, Brazil, Argentina, and GCC Countries. Some key participants operating in the global anti-drone market are Prime Consulting & Technologies, Blighter Surveillance Systems Ltd., BSS Holland BV, Thales Group, Liteye Systems, Inc., Israel Aerospace Industries Ltd., Saab AB, Theiss UAV Solutions, Lockheed Martin Corp., Security and Counterintelligence Group, DroneShield Ltd., Raytheon Co., and Dedrone, among others.